Is God’s Existence Confirmed By Prophecy Via Probability? 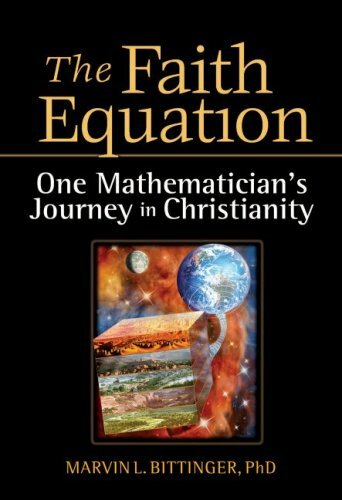 I came across a curious book by Marvin Bittinger, a mathematics educator, called The Faith Equation: One Mathematician’s Journey in Christianity. I’m a sucker for books like this, which seek to prove various metaphysical propositions using probability. None of them are in the least convincing, but I can’t help but be fascinated. Why? Well, though it’s possible to be uncertain of a metaphysical proposition, just as it’s possible to be uncertain of any physical one, with physics we know we’re in the realm of the contingent where much, most, or even all certainty is denied to us. But in metaphysics, the only satisfying argument is one which ends in truth or falsity. The indifference found in statements like “God might exist” or “God probability doesn’t exist” is dismaying. A question that important should have a definitive answer. Which it does, incidentally. God’s “existence” is well proved via more than a dozen different arguments, all metaphysical, starting with true premises reaching valid conclusions leaving no uncertainty. But don’t let’s fight over these today, else we will get lost. This isn’t a rigorous definition. As the Catholic Encyclopedia says, “St. Paul, speaking of prophecy in 1 Corinthians 14, does not confine its meaning to predictions of future events, but includes under it Divine inspirations concerning what is secret, whether future or not.” Plus, some prophecies are conditional, “Do X else Y”; if X is done, no Y. Is the prophecy then fulfilled? Well, yes, but understanding the outcome isn’t simple. Other prophecies are highly allegorical, so to speak. Just think about the book of Revelation. Bittinger chose nine prophecies because, he claims, they “lent themselves to estimating, or reasoning, a probability.” All of these have been fulfilled and so now, he says, “have a probability of 1.” This is true: given that these events happened, the probability that they happened is indeed 1. But he’s concerned about the probability of these events before they happened. What could that mean? On the 13th of April the Detroit Tigers played the San Diego Padres. Tigers lost (don’t weep). The probability the Padres won is therefore 1. But what was the probability they were going to win? There is no unique answer to that question. It is ill posed. All probability is conditional on the information supplied or evidence used. What evidence is the right or correct evidence? Historical record? This season’s outcomes? Player stats? There isn’t any “right” evidence, though there is a sense there exists a best evidence. But learning that best evidence isn’t always possible, especially in fluid human events like baseball games. Sometimes we can know something like the best, but only in highly controlled situations. Think experiments with inclined planes or electrons. Now given any set of evidence, a probability can be had. Not necessarily a numerical probability. If the evidence about the ball game was just this: “Them Padres are lookin’ good. And the Tigers relief maybe ain’t so hot” there is no numerical probability possible. Yes, people can state one, but they are not doing so based on the this evidence. The first prophecy Bittinger uses is “Israel’s Messiah Will Be Born in Bethlehem” from Micah 5:2. He gives this a 1 in a million shot. How? Firstly, he went to trouble to figure the number of villages in which Jesus could have been born. About 1,000. Second, he figures the chance the prophecy would have been fulfilled 700 years after the prediction was made, which has the probability, he says, of 1/(2*700), a figure he generates using something called a “time principle.” These two probabilities are multiplied to get a number which is less than 1 in a million. He does similar things for eight other prophecies arriving at the cumulative product of 10-76, which is mighty small. Therefore, and considering there are many more than nine prophecies in the Bible, mathematics shows God exists. See what I mean? Unsatisfying in the extreme. I feel for Bittinger. He and I are fellow believers, and we agree with the prophecies. But I can’t agree with his arbitrary quantification. One reason is metaphysical. If the prophecies were unconditional, in the form of “X will happen”, then given (at least arguendo) the best evidence “God said X will happen and what God says goes”, then the probability of “X will happen” equals 1, a number with which even atheists would agree. On the other hand, to the man who does not accept the “God said, etc.” premise, the before-the-fact prophecies are uncertain. And their fulfillment does given evidence to the hypothesis God exists. But it can never be conclusive evidence because the probabilities for fulfillment are not unique. Endless possibilities for disagreement about historical events exist. Update If you want the best of the best of these probability arguments, check out (the start of) one by Richard Swinburne: Swinburne’s P-Inductive and C-Inductive arguments (for the existence of God). Another not so great: Bayes Theorem Proves Jesus Existed And Did not Exist. I think that your mathematical friend is reversing cause and effect and when you do that the mundane does indeed often appear to be miraculous. Here is a question based on personal observation: why are mathematicians more likely to be religious than physical scientists, who in turn are more likely to be religious than biological scientists? Mostly enculturation. Embracing evolution is seen as a necessary step in atheism. Which is, of course, false. Plus the farther one moves from the strictly metaphysical, such as mathematics, to the mere cataloging of “this happened then that happened” contingent events, such as biology, the less one is aware of the need for metaphysics. Such as teleology. The circumlocutions some biologists resort to when attempting to avoid “this is for” language is often hilarious. A question that important should have a definitive answer. Wouldn’t such an answer rob faith of meaning? I don’t think so. Proving God’s existence via logical argument (I like this one by Ed Feser) only gets you to existence. Then what? That’s where faith comes in. Plus, of course, many people cannot follow that argument. These folks instead rely on faith. Just as people do who fly on airplanes and who don’t understand physics. Lots of room for faith. Not a mathematician here, but a former skeptic turned Christian. The thing that strikes me about “prophecy” is that it plays out more as a filter than a prediction. Anyone claiming to be the Messiah would have to meet the criteria given in the Old Testament prophecies to be credible. Christ was born a Jew and was steeped in Jewish scripture, as were most of his disciples. He and his disciples knew what criteria had to be met, so of course his disciples, at least, made claims the he “fulfilled” the prophecies. Frankly, I don’t care. I am concerned only with the way of life that falls out from accepting Christ as my Savior. Modern concepts of scientific method, including falsifiability and statistical “proof” did not play a part in makig the case for his divinity; only the social logic of his Gospel. There’s a saying I won’t bother quoting. Suffice, some people when they grow old(er) revert to a child-like state and start playing games. We don’t need to know about your hobbies, ad. Speaking of curious books on math and theology, do you have an opinion about Steven J Brams “Superior Beings” and “Biblical Games”? I hadn’t heard of these books before. If ever I see a used copy I’ll pick them up. From what I can tell from the descriptions, they’re right in the meat of the genre. Good finds.